Footage from Sky 5 shows the scene of a fiery, multi-vehicle accident on the Eisenhower Expressway in Chicago's western suburbs. A preliminary report into a fiery crash on I-290 last month suggests federal investigators are focusing on the possibility a driver was distracted with a phone or some other electronic device at the time of impact. 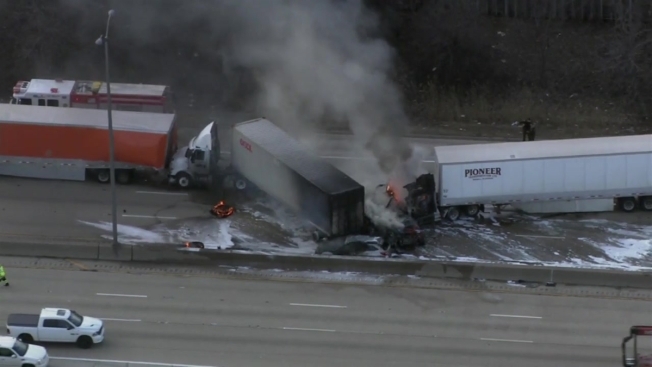 One man was killed in the fiery crash in Elmhurst March 1st, when a semi-trailer truck owned by Pioneer Transportation struck a Chrysler Sebring, triggering a chain reaction which eventually involved seven vehicles. The report, from the National Transportation Safety Board, does not assign blame. But investigators say they are “gathering various records regarding the Pioneer truck driver’s medical certification, and use of portable electronic devices.” Investigators said they had determined that the Pioneer driver was operating within his regulated hours of service, having been on duty for just over five hours at the time of the accident. The report notes that the accident, near St. Charles Road, occurred in an area well-known for heavy congestion. Investigators say the area sees an average daily volume of 134,000 vehicles, 13% of which are trucks. All aspects of the tragedy remain under investigation by the NTSB, the Illinois State Police, Illinois Department of Transportation, and the Federal Motor Carrier Safety Administration.